1) Find any frame you like and remove everything but the frame. Spray paint it if needed. 2) Head to a home improvement store. There are various types of sheet metal in the store, so I always bring a magnet to make sure I'm buying the right one. (Some won't hold the magnet.) I found mine in the plumbing section. It was under $7 for a pretty big sheet of it. 3) Measure the part of the frame that the metal will fit into. I like to draw the measurement onto the metal with a Sharpie. My frame was 12"x12". 5) Slide it into your frame. If you need it to fit more snuggly just cut cardboard to back it. 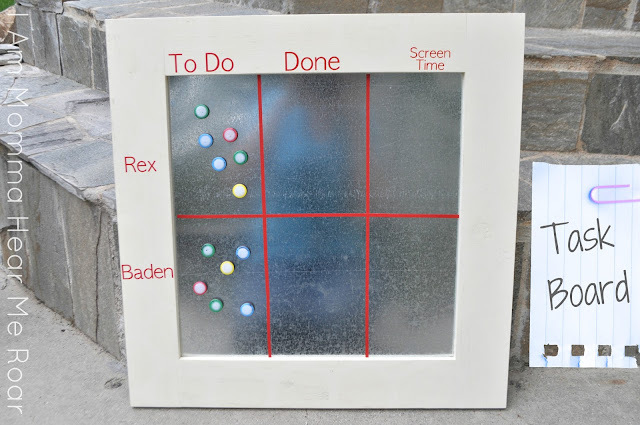 Now you have a custom magnet board for a really low cost. I switched our task board to this smaller one because the huge one didn't really fit anywhere. This little board has helped out a lot. I haven't had one fit from Rex about going to the bathroom in the morning. He understands that he has to do his tasks before he can have any sort of screen time and this just really clicked with him. Baden is still a little young to fully grasp the concept of the board, but he'll grow into it. Tomorrow I'm going to show you where I put the board and the little wall I created for them. See you then. Thanks for reading. I think I am going to make one of these for my girls. They are constantly "forgetting" to do their chores! This is a great post and PERFECT timing! I am getting ready to do this... My question is... My husband and I are remodeling our new home. The custom cabinet builders built two cabinet doors incorrectly, and they are our's to keep. He said to me, "if you're real crafty, you can do something cool with these!" Ha! This came to mind... I would love to place a piece of sheet metal onto the "inside/recessed" area of the door. Can sheet metal be glued? If so, do you have any recommendations? Or other suggestions? My frig is Stainless Steel meaning no magnets, so I'd like to hang these with ribbon in my pantry for notes from school, art work, etc. I have never glued sheet metal but I would think it would totally be possible. Maybe try that E6000 industrial strength adhesive? You could make a template out of paper to get the right size and then trace it onto the sheet metal. Sounds like a fun project! Good luck! Liquid Nails would probably do the trick too! I am linking this to my Tutorial Tuesday post tomorrow. Such a great idea! I'd love to make one for my daughter and her nap times as a reward for being quite. :) Thanks for the idea! I want to use some sheet metal to make a magnet board for my son's bedroom, for all his letters and such! Thanks for the inspiration!